* Giclee Canvas SIlver Edition is available in 24″ x 32″ only. ** Fine Art Paper Silver Edition is available in 15 1/2″ x 20 1/2″ only. 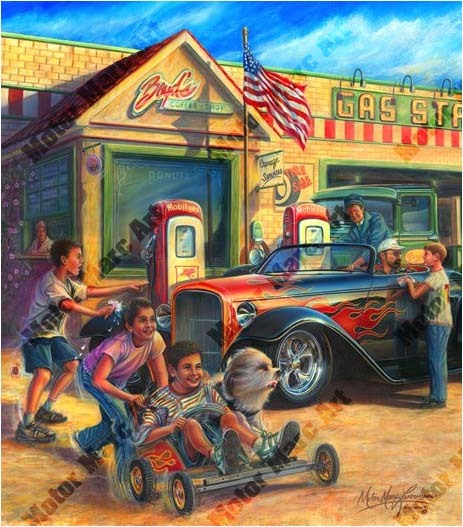 Media Size Choose an option15 1/2" x 21"24" x 32"
The sounds of clattering go-kart wheels and children laughing mask the approaching rumble of American V8 power as it idles up to the pumps. The children’s lazy summer day is forever transformed as American Hot Rod icon Boyd Coddington makes an appearance. Boyd Coddington’s 32 Ford Hotrod, defines automotive cool and is portrayed in this, the first in a series of paintings depicting the custom cars that have made Boyd and the popular television show, American Hot Rod such a success. This scene takes the viewer back to a simpler time where a child’s fascination with Hotrods would plant the seeds for a lifetime of interest in cars. Like Coddington, artist Motor Marc strives to capture every nuance that stirs the soul with paintings that tell a story. From the chrome wheels sparkling in the sunshine to the custom flame job that seems to leap off the car Motor Marc’s rendition of this classic scene is sure to rekindle memories of that first encounter with custom automobiles. Don’t miss out on this opportunity to re-live the dream and own an officially licensed print of this latest automotive masterpiece. NEW RELEASE: This is a limited fine art reproduction, featuring one of the amazing 1932 Ford Boydster II Hot Rod, seen on the popular television series American Hot Rod™ and built by Boyd’s team. * Licensed by Boyd Coddington Hot Rod Inc.
15 1/2" x 21", 24" x 32"